Whether or not you play this game competitively, there is one thing every player pays close attention to, and that is the Scouting Box. When this game began, it was a much simpler time (although, arguably the harder times), when your only anticipation is only to wait for the SR guaranteed 10+1 box. Yes, we used to have standard 10+1 boxes that do not guarantee SRs. Fast forward to today, all 10+1 on typical boxes now guarantee SR or above, and there are nearly a dozen of Player Choi—I mean, variations on scouting boxes. This, of course, begs the question of which box will offer you the highest sense of pride and accomplishment. How do you actually scout? Before we get into the topic of the boxes, let’s first talk about the resources we need in order to perform a scout. In the very old version of the game, Love Gem is the only currency you can use to perform a scout. But today, there are a couple of other scouting-related resources that is worth discussing. I’m including this here just for the sake of completion. 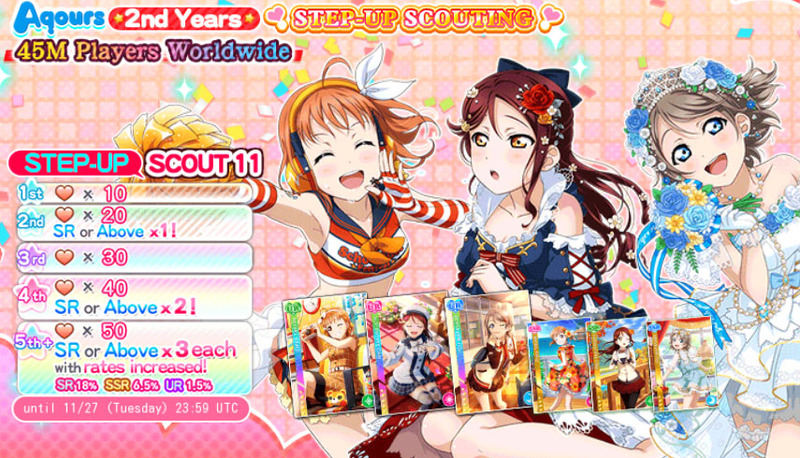 Regular Scouting Box contains only N and R rarity cards, and you can scout from them using Friend Points earned through sources similar to Love Gems. Early on in the game, you will want to spend your Friend Points plowing through this box to idolmax every cards you can get your hands on. You get one free shot on each side of the game once per day. It’s not a whole lot, but on lucky day, you may get R’s, which you can just sell off for random easy stickers. Because there is nothing of extremely high value to note in this box, it is often omitted from all kinds of discussions. This article will not refer to this box again in any way. There is not a whole lot to talk about this item, since I’m pretty sure most people are aware of what it does. In a typical scouting box, you spend 5 gems to scout one card. 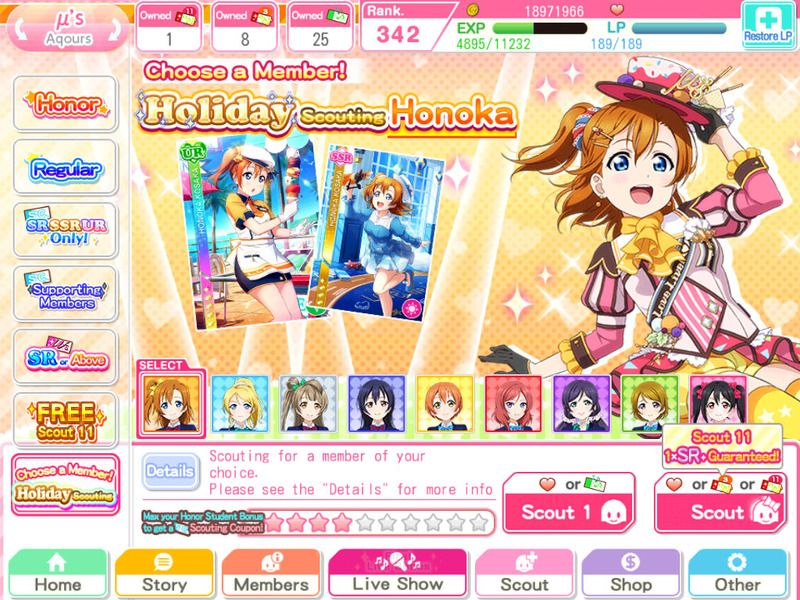 Spending 50 gems at once let you scout 10 cards, plus one additional card for free, usually with the promise of getting a card of SR rarity or above. Step-Up Boxes (which we will discuss later in this article), allows you to perform scouts at a varied number of gem cost depending on the box. Scouting Tickets (“GT”) are obtained as rewards from log-in bonuses, Events, and Goals / Achievements. One ticket allows you to perform one Honor Scout on eligible boxes. They are definitely a nifty freebie to have on hand. This item, and the ones that follow, are paid-only resources, so F2P players may never have their hands on these. However, if you are an aspiring whale, read on for more info (I don’t have a better image of the item. Sorry). This item is basically a bundle of 3 GTs; it allows you to perform Honor Scouting 3 times (notice the number “3” on the item icon) on eligible boxes with no rarity guarantee whatsover. This item has been on sale on Japanese version of the game for a while now, but the Worldwide version has just recently had them on sales. They are not too special, so don’t feel like you’re missing out too much without it. Once again, another paid-only resources. 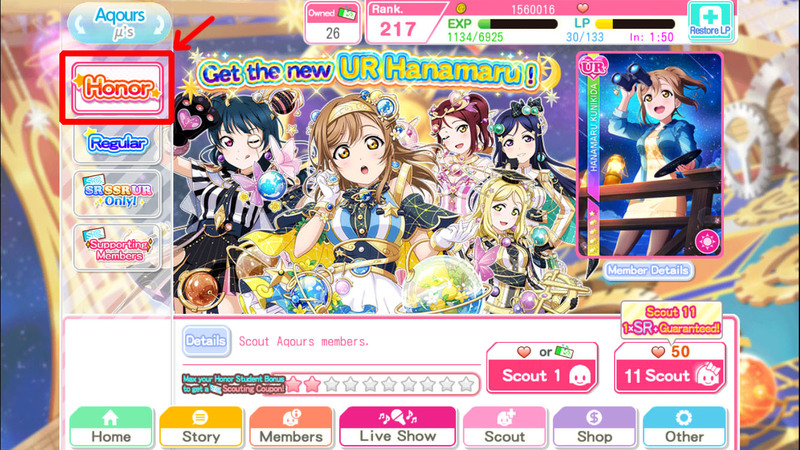 This item allows you to perform a 10+1 Honor Scouting on eligible boxes, and where it is eligible, it also guarantees one SR or above. This ticket is frequently on sale on various occasions, usually being bundled on “large packs” that cost roughly the same as the price of 50 gems. One thing to note about these items is that they can only be used on their exclusive box. 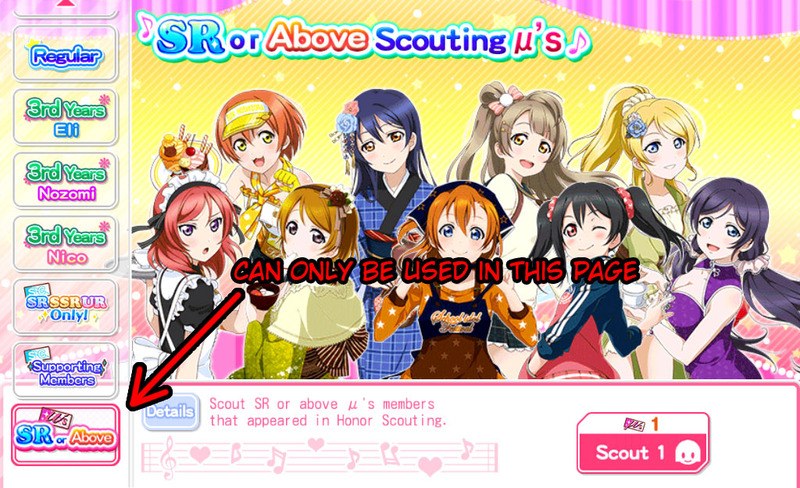 This means you get an entirely different section on the Scouting page, where you can use these tickets. These ticket exclusive boxes usually have all the cards that are released from the beginning of time to date, however, you should check its contents prior to utilizing your ticket, if you are hoping to get the most recent cards from it. Another implication is that these tickets cannot be use on other typical scouting boxes, and there is no extra rate up or chance to get a specific card or member (unless it is out right specified on the ticket’s face). Honor Scouting is usually dubbed the “main” scouting box. 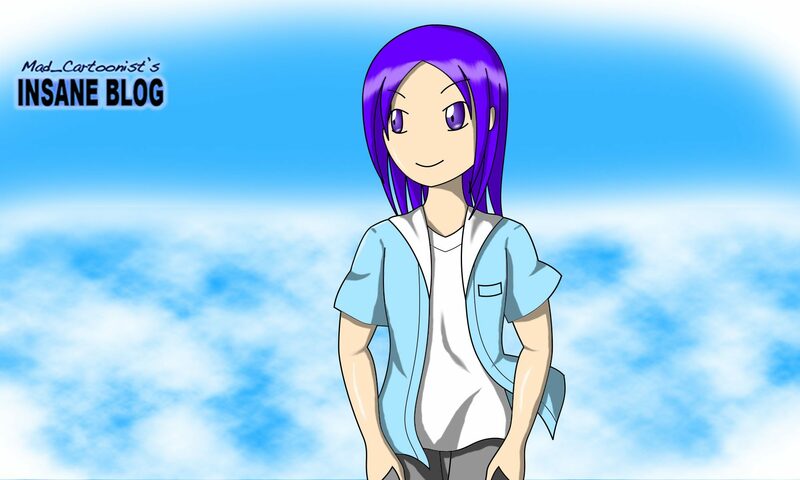 It is always available on the first tab of the Scouting page, and its contents are constantly updated. 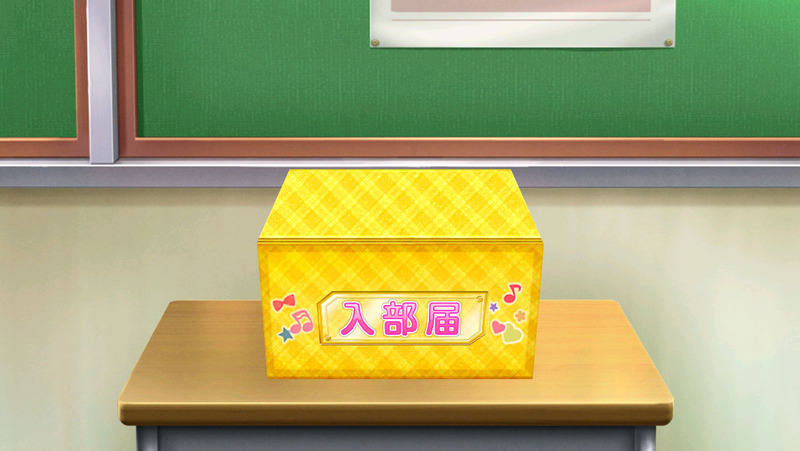 Nearly all newest cards are released in this box first before it is released in other type of scouting boxes. For a certain amount of time, the newly released cards will also have an appearance rate increased. Take note that as new cards are added into this box, older released cards are also removed from it. Be sure to check the in-game banner for more information on which cards were removed, before committing to scouting in them, just in case. Campaign Box is a blanket term I used to refer to special boxes that are released on special occasions, such as Halloween, Chrismas, or a particular girl’s birthday. These boxes usually feature rate up for cards that fit the occasions. The boxes in this campaign can be a standard typical scouting box (5 for 1; 50 for 10+1 SR or above) with various little tweaks, or a Step-Up box, which I will explain in a bit more detail below. Free 10+1’s or any other free scouts that are offered to players on special occasions all practically belong under this category. One of the most notorious boxes to be released in the Worldwide Version of the game, just before this past new year, was the “Choose Specific Member Box with tripled rate for URs and SSRs”, as shown above. 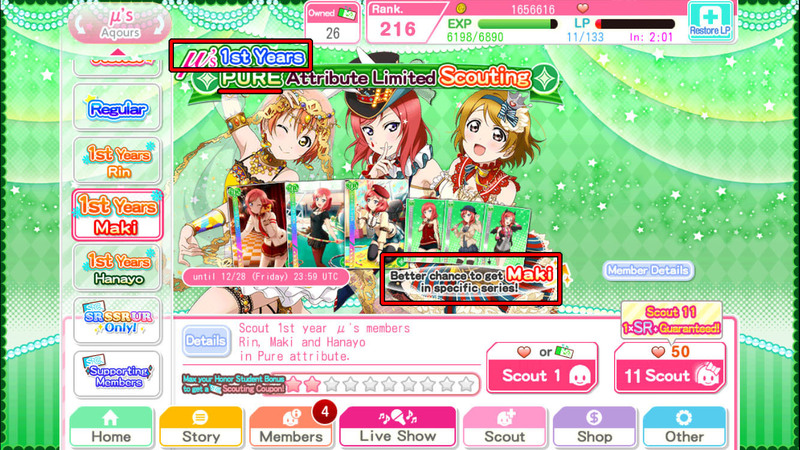 Limited Scouting refers to boxes with ‘limited’ pool of cards. These pool of cards are usually dictated by attributes, student year, or sub-unit, and always specific to an idol group (for instance, you are not going to see second year boxes that contain second year students of both µ’s and Aqours; only either of them). 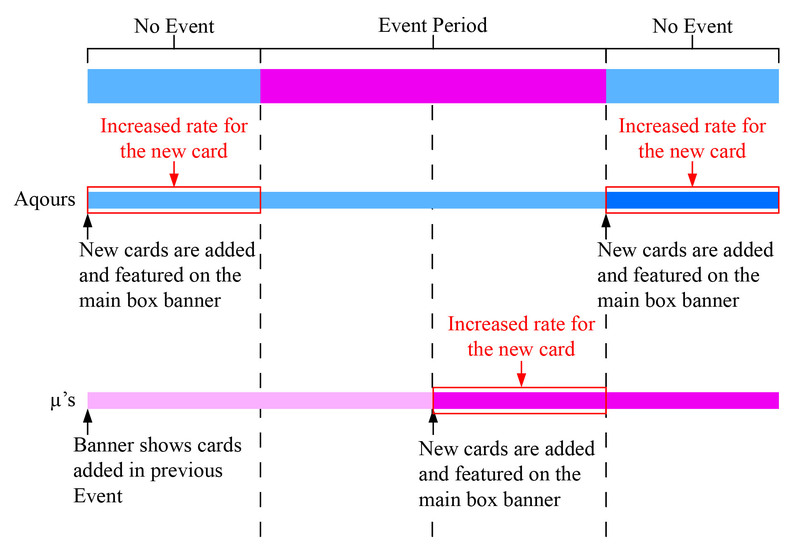 Recently, on top of the specified pool of cards, these boxes also have an increased rates for a specific set of cards. Because of this, these boxes are especially attractive if you are looking for a very specific card from a certain set. They are usually released during Events and will stay for a couple of days, before shuffling out for a different one. Most players refer to this kind of box through its featured contents, such as Pure Printemps Box, Smile 2nd Year Box, Cool BiBi Box, and so on. Some of you may have noticed that I’ve avoided using the word “limited” almost throughout this entire section, and that’s because when most players refer to “Limited Boxes”, they are NOT referring to this kind of box at all; they are talking about the next item in line. Box Scouting refers to a special kind of scouting where there is a “finite” number of cards within the box. The number of cards and their rarities remaining in the box is revealed upfront in its respective section. For instance, if the box says it has 1 standard UR remaining, then one of the cards you can get will definitely be a UR, but which UR that is will entirely be randomized based on the list of card contents of the box (again, check the box’s details). Scouting the entire box (usually refer to as “emptying” it) let you keep every contents within it. Some boxes also let you choose the member to be featured as the UR within the content of the box. 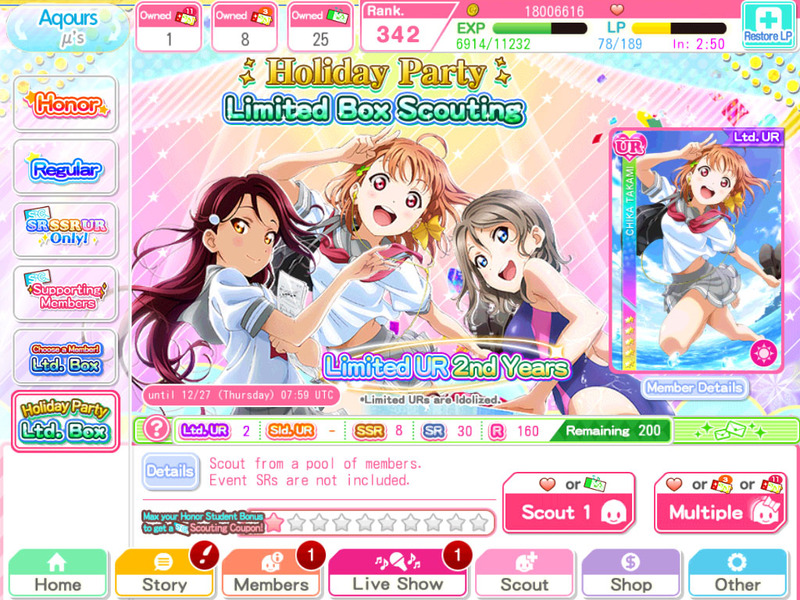 Due to how this box works, unlike practically every other boxes in this list, 10+1 scouts in this particular type of box do NOT guarantee SR or above. The main highlight of Box Scouting is that they usually featured Limited UR cards that are not released or available else where. Because of this, when players mentioned “Limited Boxes”, they are talking about this kind of box in particular. Once you’ve emptied its contents, you can reset its content and scout from it again, although some boxes do not allow that, or limit the number of times you can reset. These boxes are actually a sub-set of Campaign Boxes, but because they have their own mechanics and internal workings, I’ve decided to describe it separately. These boxes collectively have a certain number of “steps” you can scout in a given sequence. For each time you scout, you progress through a “step” and climb higher up to the next reward step. The discounted gem cost for Step-Ups come in various degrees; some Step-Ups start with costs as low as 3 gems for one card (no SR guarantees), and some end with grand final prizes of SSR+ guarantee or UR rate up. Some Step-Ups also give you various rewards such as Scouting Coupons or Sugar Cubes / Pots. Some Step-Up Boxes disappear after you scouted in the final step, while for some boxes, the final step can be performed indefinitely, retaining the full effect of its perks. The banner of each Step-Up Box usually tells you everything you need to know about its contents and reward steps, so be sure to read its detail carefully before committing to it. Finally, keep in mind that, you do NOT have to scout all the way until the final step; you are free to stop whenever you like. Is it better to do a solo yolo or a 10+1?? This, perhaps, is the oldest question that persisted from the first day this game was launched; it’s been discussed countless of times and I personally hate having to explain it again, but I included it here, once again, for the sake of completion. NO, performing a solo yolo is NEVER BETTER than a 10+1 under ANY circumstances. There is absolutely no circumstance where doing a solo yolo is preferable to a 10+1. At its most basic form, in a solo yolo, you are scouting 1 card at the cost of 5 gems. In a 10+1, your cost of 1 card is approximately 4.5 gems, which is evidently lower. If a cost basis does not make sense to you, let’s try probability basis. If you are performing 10 solos, back to back, you are spending 50 gems for 10 attempts of card pulls. However, for a 10+1, you are spending the exact same cost (50 gems), but you are getting 11 attempts of card pulls, which is one attempt more than what you would get from a solo yolo. And the above is just at the most basic level. We have not yet considered various other options, such as the fact that SR or above is guaranteed in a typical 10+1 box, or the fact that you can go for Step-Up Boxes, which has EVEN LOWER cost per scout, and the cost for the first step usually isn’t high. Well, that’s great for you. But remember that the scouting boxes are completely RNG-based. If you’ve gotten more URs from solo’s, or think that it is more exciting, that’s perfectly fine. But solo yolo is statistically not better than a 10+1. Did you forget about Blue Tickets? Blue Ticket / Scouting Coupon scouting is an entirely different can of worms I’m not really sure I want to explore. Unlike solo yolo’s which are statistically inferior, there are some gray areas for Coupon Scouting that makes it a rather difficult topic to discuss without asserting very personal opinions. I may cover it in the future if I get requests for it, but for now, I do not have plans to talk about it. And that concludes my guide on the basics of scouting boxes. However, we are not quite done with this topic just yet. Next week, we will look at the scouting boxes in a little deeper detail, such as main box listing prediction and some alternate perspective to Box Scouting. As always, if you find this article helpful, feel free to use it as a source of reference and share it to your friends. Hope you guys enjoy reading this article. 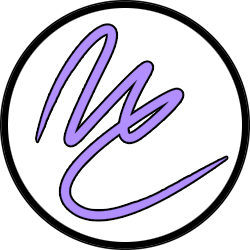 This has been the Mad_Cartoonist. Signing out.